Hockey is a rough and tumble sport that can take a seemingly innocuous fall and turn it into a real problem. Last Thursday, the Dallas Stars’ “dependable, durable” defenseman Trevor Daley left the game after a collision with James van Riemsdyk. Coach Lindy Ruff commented, “He’s got an injury that looks like it’s going to be a little bit of time. Our people will evaluate it, but I can just tell you that it’s going to be nothing that is going to be short-term.” Experts say Daley has a high ankle sprain, which could mean a four to eight-week absence. Unfortunately, this type of sports injury is a common reason for hockey players to find themselves benched. A 2004 study of the St. Louis Blues and Dallas Stars found that five players sustained lateral sprains during that season. This common type of ankle sprain happens when the ligaments on the outside of the ankle stretch or tear. Usually, an accidental movement forces the sole of the foot to turn inward, causing pain and swelling in the twisted ankle. Players with lateral sprains were back to the game in 0-6 days (or a mean time of 1.4 days). That same year, 14 Blues and Stars pro hockey players suffered from syndesmosis sprains. 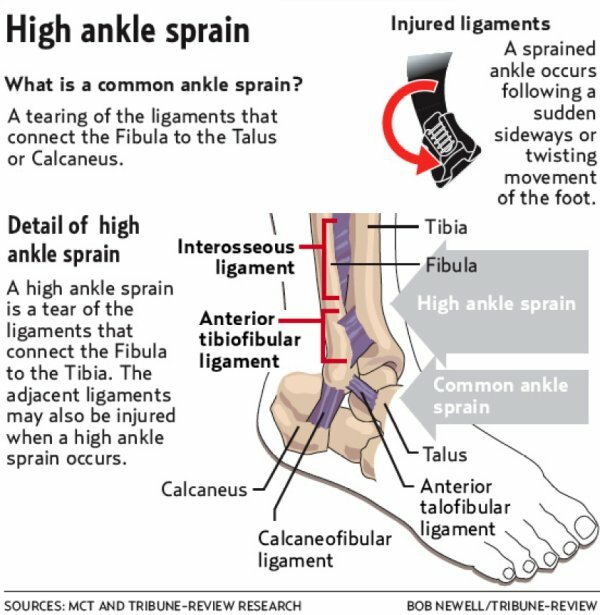 This type of sprain is also called a “high ankle sprain” because it occurs above the ankle joint. The “syndesmosis” is where the tibia and fibula bones come together, so a syndesmosis sprain affects at least one of the thick connective ligaments in the joint — the anterior inferior tibiofibular ligament, the posterior inferior tibiofibular ligament, or the transverse ligament. This ankle injury ranges from a minor overstretching of the ligament to an actual tear. In general, it takes twice as long for syndesmosis sprains to heal. The extended holiday from game play ranges from six to 137 days, with a mean time of 45 days. Researchers at the State University of New York at Buffalo report that younger athletes are also falling victim to high numbers of ankle sprains. “The risk of injury in youth hockey is high, due to contact from body-checking,” as well as players’ failure to keep their heads up and pay attention to their surroundings in addition to the puck, researchers concluded. Ankle sprains are one of the most common injuries and a source of significant lost playing time. Up to 18% of all ankle sprains are believed to be syndesmosis sprains, which often go undiagnosed and lead to calcification and chronic pain. Rest, ice, compression, and elevation are necessary for immediate acute treatment of all ankle sprains. Once swelling is under control, activity may gradually resume. Our NY sports medicine and physical therapy team helps athletes get into a program of walking, jogging, exercise band stretching and strength training. Though there are taping methods and tight skate fittings, it can be difficult for hockey players to return right to the rink. We usually do not see a return to skating before six weeks with more serious ankle sprains. Blood supply to the syndesmosis is poor, which slows the healing rate. Also, any twisting, turning or pushing maneuvers can cause further tearing and delay healing even more. We advise that players avoid the temptation to “play through the pain,” as this only causes further ankle injury.